For fighter info, see Daisy (SSBU). Official artwork of Princess Daisy from Super Mario Party. Princess Daisy (デイジー姫, Princess Daisy) is a recurring character in the Mario series. 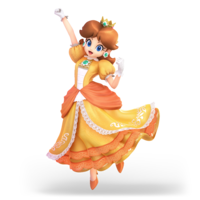 Originally appearing in Super Mario Land, Daisy is the ruler of Sarasaland and has become a recurring playable character in several Mario spin-off games since her debut, most notably the Mario Party and Mario Kart series. Artwork of Princess Daisy from Mario Party 3. This appearance is the basis of her trophy in Melee. 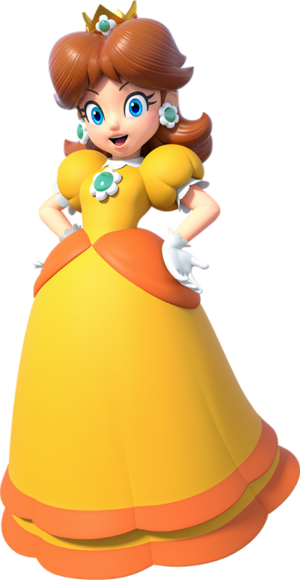 Princess Daisy is the ruler of Sarasaland, a country that is composed of four kingdoms (Birabuto Kingdom, Muda Kingdom, Easton Kingdom, and Chai Kingdom) and located very far away from the Mushroom Kingdom. One day, a mysterious space alien named Tatanga invades Sarasaland. In addition to hypnotizing all the country's inhabitants to enslave them into his army, Tatanga kidnaps Daisy in order to marry her and make her his queen, thus setting the events of Super Mario Land into motion. Upon hearing of this, Mario journeys to Sarasaland to rescue Daisy and bring peace to the country by traveling through each of its four kingdoms in order to stop Tatanga and his invasion. Throughout the game, enemies disguise themselves as Daisy to trick Mario into believing he has rescued her, only to reveal their deception seconds afterward and run away. Although Tatanga ultimately manages to escape, Daisy is rescued regardless and Sarasaland returns to peace, resulting in Daisy thanking Mario with a kiss as she flies away with him in an airplane. Since then, Daisy has become a recurring character featured almost exclusively in Mario spin-off games, most notably the Mario Party and Mario Kart series. However, Super Mario Run marked Daisy's return to the Super Mario series almost 30 years after her debut in Super Mario Land. In this game, Daisy is an unlockable character as of version 3.0.4. When the Remix 10 Warp Pipe opens, Toad informs Mario that she has gotten lost and thus needs to be rescued. Daisy is unlocked once Area 30 is cleared during Remix 10 mode, and her special ability is the Double Jump. In addition to her initial design being strikingly similar to Princess Peach's, NES Open Tournament Golf furthered the notion of Daisy being a counterpart to Peach by having her as Luigi's caddie. Daisy and Luigi's relationship has since progressed into a reciprocal, yet subtle romance that has been demonstrated in numerous instances, such as her victory scene in Mario Power Tennis; her personal race course in Mario Kart Wii; and her trophy information in Super Smash Bros. Melee and Super Smash Bros. for Wii U. Daisy has also forged a close friendship with Peach upon traveling to the Mushroom Kingdom, and has remained a friend of Mario's ever since their first encounter. 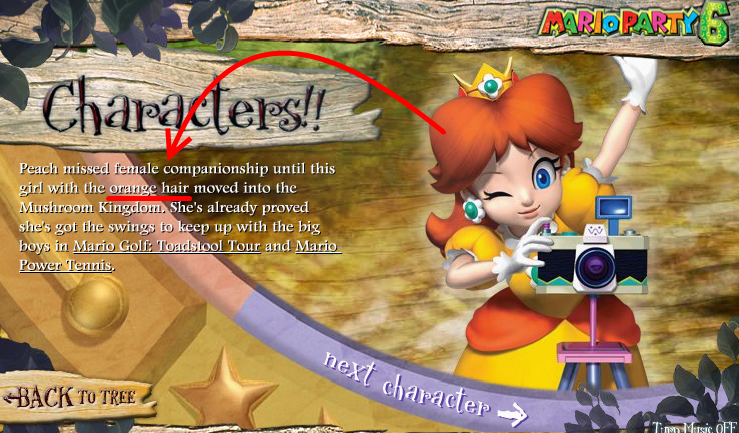 Unlike Peach, however, Daisy is an energetic tomboy. Despite being featured almost exclusively in spin-off games since her debut, Daisy's personality has nevertheless been explored to a degree. In particular, Fortune Street reveals that Daisy is energetic to the point of being impulsive, eager to take on challenges, and even brash enough to talk down to the likes of Wario, Waluigi, and Bowser. Unlike most alternate costumes, which either recolor an attire or add minor embellishments, Peach's Daisy-inspired costume both recolors and modifies several other aspects of her design. Daisy appears as a trophy. She is also the basis for one of Peach's alternate costumes, which changes many aspects of her appearance to match Daisy's. Both Daisy's trophy and Peach's Daisy-based alternate costume are based on her classic design used in Super Mario Land to Mario Party 3. Daisy trophy in Super Smash Bros. Melee. The princess of Sarasa-land, Daisy met Mario when he helped defeat the evil alien Tatanga in Super Mario Land. Princess Daisy is a bit of a tomboy when compared with her counterpart, Princess Peach. After her appearance in Mario Golf, some gossips started portraying her as Luigi's answer to Mario's Peach. Daisy once again appears as a trophy, this one depicting her athletic gear from Mario Strikers Charged; she also appears on two stickers. Daisy is once again the basis for one of Peach's costumes; however, unlike in Melee, no model elements are changed for this costume and it is a simple recolor. 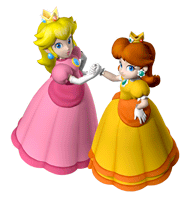 Also, Peach's Daisy-based alternate costume is based on the colors of Daisy's current appearance since Mario Party 4. Striker Daisy trophy in Super Smash Bros. Brawl. The princess of Sarasaland and an upbeat and cheerful go-getter. She has appeared in titles ever since Mario saved her after her kidnapping by the tyrannical alien, Tatanga. Although her iconic look is a yellow and white dress, she goes with a sportier look in Super Mario Strikers to compliment her spunky scoring strikes. Daisy appears as four trophies in these games, with one exclusive to Super Smash Bros. for Nintendo 3DS depicting her tennis outfit, and three being exclusive to Super Smash Bros. for Wii U depicting her standard and baseball outfits, as well as her baby self. Daisy continues to be the basis for one of Peach's costumes, while a Daisy wig is also available as a headgear for all Mii Fighter types. More notably, Daisy's baseball appearance appears in Smash Tour as a red item. A player who uses it will automatically catch all thrown items for the duration of a battle. Similar to Peach in how she plays tennis, Daisy also packs a seriously powerful shot. Maybe their choice of colors symbolizes their personalities? They're alike in a lot of ways, but if you could choose just one, would you choose Princess Daisy or Princess Peach? Like Peach, Daisy is a Technique player, but she has something else up her sleeve: a really powerful shot. Do you think the sedate pink and vivid orange reflect Peach and Daisy's different personalities? Would you say you're more Team Peach or Team Daisy? Or maybe... Team Both? She may be the princess of Sarasaland, but she doesn't exactly have the poise you might expect from royalty. Daisy is more of a headstrong, active type. That's all part of her charm, though, and rumor has it Luigi is quite smitten with her. Unlike Peach, she's only really been kidnapped once - in Super Mario Land. She may be the princess of Sarasaland, but she doesn't exactly have the poise you might expect from royalty. Daisy is more of a headstrong, active type. That's all part of her charm, though, and rumour has it that's why Luigi's so smitten with her. Unlike Peach, she's only really been kidnapped once - in Super Mario Land. The Daisy (Baseball) trophy is unlocked by hitting Sandbag 1,000m (3,280 ft.) or more in Home-Run Contest. The captain of the Daisy Flowers, Daisy is great both when at bat and when defending. Her fastballs especially are a thing to be feared. Her Star Swing, Flower Swing, will cause a garden to bloom where the ball lands. Fielders will have to wait for the flowers to clear away. What a pretty delay of the game! When it comes to baseball, Daisy, captain of the Daisy Flowers, is good at battling and even better at defence. She throws a mean fastball when she's on the pitcher's mound, and her batting special, Flower Swing, makes a garden bloom in the outfield. Who says there's no time to stop and smell the flowers in the middle of a ball game? This cute toddler made her first appearance in Mario Kart Wii. If she looks familiar, that's because she's a baby version of Princess Daisy! Look at the determination in those baby eyes-even at such a young age, she was full of drive! Orange was her favorite color at that age too. Even her pacifier is orange! This cute toddler first showed up in Mario Kart Wii. If she looks familiar, it's because she's just a baby version of Princess Daisy. Look at the determination in those huge eyes - even at such a young age, she was full of drive! And from looking at her clothes, dummy and kart, it seems her taste for orange fashion started early too! Daisy (Tennis Outfit) trophy in Super Smash Bros. for Nintendo 3DS. Daisy trophy in Super Smash Bros. for Wii U.
Daisy (Baseball) trophy in for Wii U. Baby Daisy trophy in for Wii U.
Daisy, as she appears in Super Smash Bros. Ultimate. Daisy was confirmed to appear in Super Smash Bros. Ultimate as a playable fighter on June 12, 2018 at the E3 2018 direct. She is an Echo Fighter of Peach and nearly functionally identical to her save for slightly different hurtboxes due to altered animations. She also has various aesthetic changes such as unique animations and expressions, and flower effects in her attacks instead of hearts. Like Peach, Daisy's appearance is altered in Super Smash Bros; her dress has more elaborate details and is stylized. Also, Peach no longer has her Daisy-based alternate costume as Daisy now has her own character slot. Additionally, the Daisy wig returns as a headgear option for Mii Fighters. Daisy's trophy in Super Smash Bros. Melee has a graphical glitch in which she has a third eye on the back of her head under her hair. This glitch was removed in the PAL and NTSC 1.2 versions. Daisy has the largest amount of trophies (four) than any other non-playable character featured in Super Smash Bros. 4. In Super Smash Bros. for Wii U, the video cutscene that plays after Peach's congratulations screen makes various references to Princess Daisy. In one scene, Peach in her Daisy color scheme is shown grabbing Luigi, and in another scene, Peach along with another Peach in Daisy's color scheme are shown floating away from a Chain Chomp together. Peach's congratulations screen in Super Smash Bros. for Nintendo 3DS also features a picture of her and another Peach in Daisy's color scheme posing together. Rosalina & Luma's Classic Mode congratulations screen in Super Smash Bros. for Wii U also features two Rosalinas posing and standing close together; one pink and one yellow. This may be a reference to Peach and Daisy, and bears a resemblance to their artwork from Mario Party 7. This page was last edited on April 11, 2019, at 23:35.